I just received a query on how to check the internet speed of your connection. So here is the instruction. How To Check Speed of STC , Mobily or Go Internet Connection ? 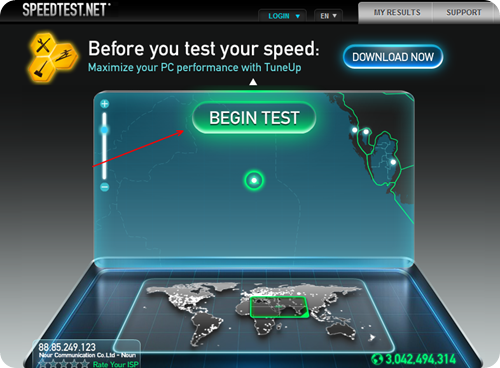 In order to get your actual speed in your computer you need to go to speedtest.net , on that site just press Begin Test , wait for some time, and the site will give you the details of your download speed and upload speed. Through this you will be able to see the speed that you are getting in your computer. It will also depend on how many computers are connected to your network, The site will measure the the speed at your own computer and not the speed given by STC, Mobily or Go. You may check the settings of your router where it will normally tell you the signal strength that the mobile company is giving. I hope this will help future visitor looking fro this kind of information. I’m very much satisfied with any – STC, or Mobily internet services. So, I never tried to test their speed. The official sites are different. If you have any problem with your speed, STC and others ask you to check with their testing websites.